Unlike ordinary investment funds, Max InvestSave locks-in the highest returns refer by Reference Index Value (RIV) achieved during the chosen tenure. At maturity, you are protected on your maximum returns as well as from any adverse fluctuations that may have occurred. The graph below explain the concept. Deposit any amount, any time (minimum of RM50). No deposit allow 5 years before maturity. Withdraw any amount, any time at the market price. No penalty will be charged upon early withdrawal. Redeem in part or in full (minimum 0.01 units). Choose from tenures of 15, 20, 25 or 30 years. 100% principal protection if held till maturity. Covered by the Malaysia Deposit Insurance Corporation for up to RM60,000. Max InvestSave is based on Restricted Mudharabah concept with profit sharing ratio of 95% (Depositor) : 5% (Bank). 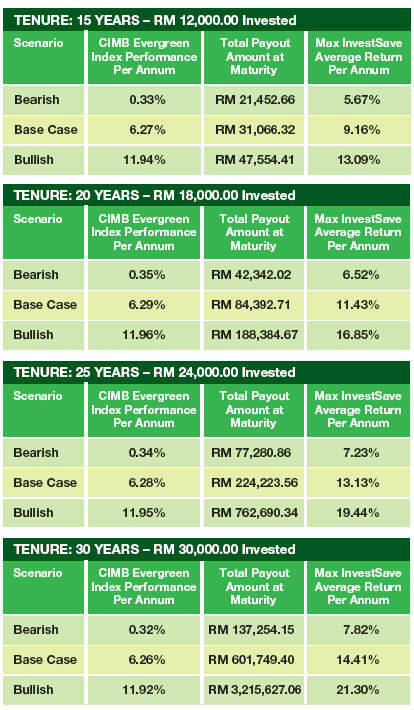 The performance of Max InvestSave will track the dynamic investment strategy of the CIMB Evergreen Index. This will allow the investors to gain higher potential returns, even under different market conditions. CIMB Evergreen Index tracks a wide range of markets across major economic regions and asset classes. It will adopts a Risk/Return Optimisation strategy by finding the best possible asset class allocations to maximise returns with controlled volatility (Standard Deviation) of around 10%. CIMB Evergreen Index also adopts a Long/Short strategy which proactively trades when markets are bullish or bearish. Basket of multi-assets are selected and may be substituted. Among the assets that part of the baskets are equity, commodity, property and currency market. The graph below shows the index performance since introduction in 2002 with comparison with Major Indexes. The return to date is 144%. CIMB is doing a Monte Carlo simulation on the fund performance based on historical data. The parameters used to generate the 3 scenarios are more conservative than the actual realised historical parameters since 6 June 2002. 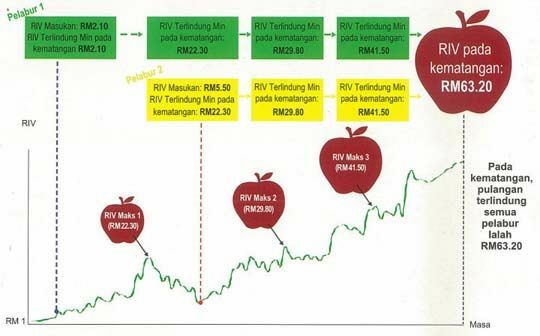 The table below are the expected retun if the investor invest RM100 per month until 5 years before maturity with no early redemption. For me, I already subscribe to this fund since October 2008. Will looking to do more topping up before the bonus unit promotion ends in December 2009. More information about Max InvestSave investment kindly proceed to CIMB webpage. What do you think about this fund?